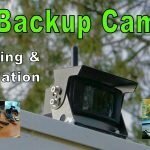 Two weeks ago I published a blog post and video detailing the installation of my new Haloview Model MC7108 wireless backup camera. Well since that time we have journeyed from Vancouver Island down the Oregon coast and into northern California. 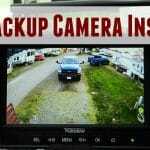 We’ve traveled a distance of over 1000 km (600 miles) putting the new backup camera system to the test. 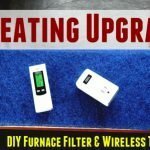 Having given myself time to use the camera system I’m back with a full product review. I’ve used it in all sorts of weather conditions from pouring rain/fog to bright sunshine. It’s been used on freeways, highways, backcountry roads, urban streets and of course in campgrounds. Fair Disclosure: I received the Haloview free of charge. Overall I’m pleased with the Haloview product. It’s been a big step up in display quality versus my older Tadibrothers backup camera it replaced. The contrast, vibrancy, and crispness are much better. Making it easier to see during bright, glaring light conditions. I’m impressed by how well the camera handles harsh high dynamic range lighting conditions. Here you see me backing the RV into a campsite right into the setting sunlight. I almost forgot the Haloview backup camera had a mic on it for sound pickup and recording. I kept hearing a funny noise when driving and finally figured out it was coming from the display picking up road noise as we drove. I have to say the sound is not great. I find it full of distortion and I usually keep it muted. One interesting thing, though muted, the audio still records to the DVR AVI file. 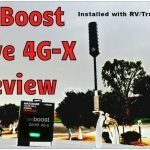 The wireless connection has been solid without one glitch or blackout even when towing the trailer through wireless signal dense urban environments. 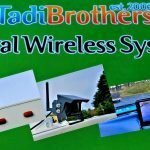 My old Tadibrothers unit had good wireless connectivity on the rural highways did suffer the odd glitch and blackouts in cities. Acceptably short in duration but worth mentioning. 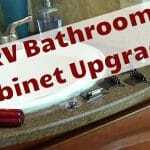 As outlined in my previous post, installation was relatively straightforward. 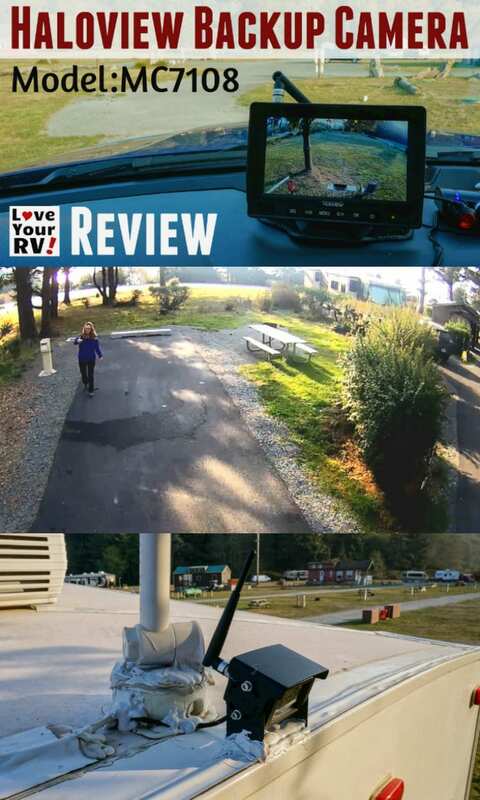 The camera mounts on the rear portion of the RV, I picked the top middle location for a broad overview. 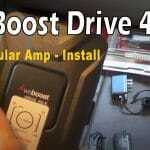 The hardest part of the install is wiring it to a 12-volt DC source. 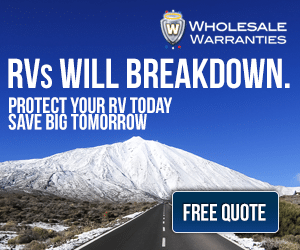 Many folks use power from one of the RV clearance lights. I used an existing source from the previous camera install. 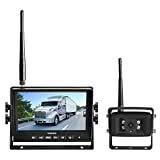 After the camera is installed, the 7″ display can be hardwired to a 12-volt DC source behind the dash or plugged into a 12-volt DC cigarette style receptacle. For more elaborate installations the kit includes trigger wires to control up to 4 cameras. 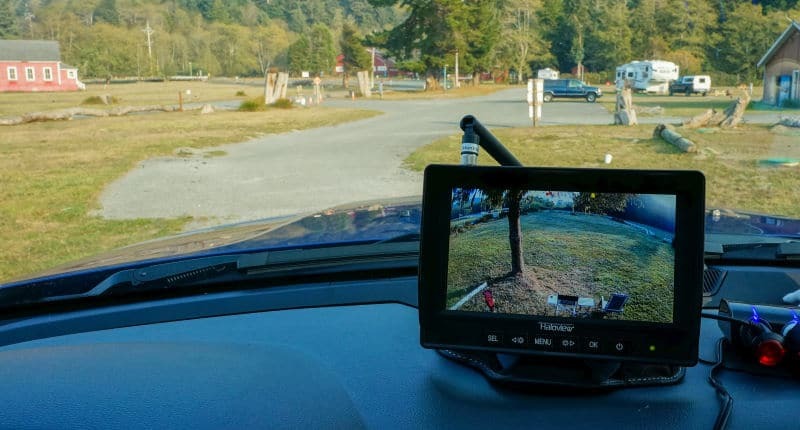 For best signal connectivity Haloview recommends mounting the camera above the roofline in sight of the display’s antenna. 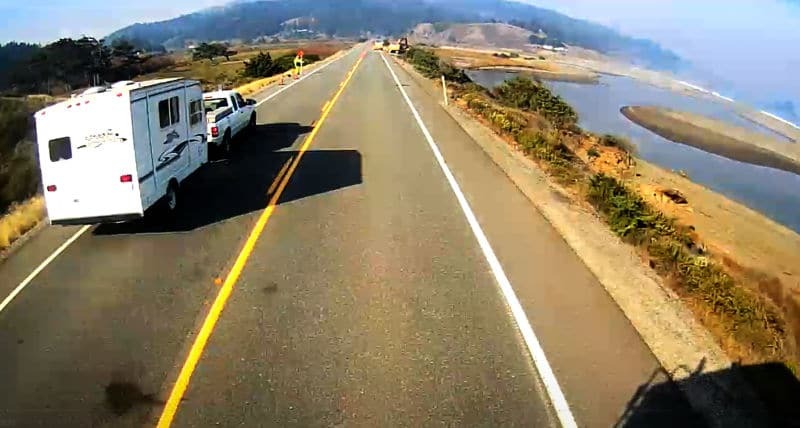 Well obviously with a fifth wheel trailer it’s not going to happen as the roofline peaks in the middle and slopes to the rear, and the truck sits well lower. As a result, I didn’t get full 5 bars of signal, averaging about 2-3 bars still plenty enough for a reliable connection. Our Cougar fifth wheel trailer is 30 feet long, total rig length with Ram 3500 truck hooked up is 45 feet. On a longer rig or one with a metal roof, weak signal strength could be an issue. Best bet is to test reception before doing any permanent installations. For weak signal situations, Haloview sells an optional antenna extension kit. They have offered to send me one to test out, and I’ll report back on a few weeks. The DVR (Digital Video Recording) function has worked as advertised. The recording quality is decent enough, but I find it a step down from the live version. I bought an inexpensive micro SD card and set it to record in a loop overwriting older recordings. I can easily pull it out and transfer the video AVI files to my laptop for viewing. 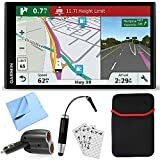 Along with my Garmin Dashcam recordings, these could prove invaluable in the event of an accident or as a security measure. The programming and control buttons have a quality feel to them, and the menuing system is well laid out. Every function is easy to find and get to within a few button presses. All the settings and adjustments are located in 10 labeled categories. When pressing the power button the display pops on quickly; the menus are responsive. 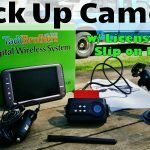 Having a backup camera is all well and good, but I believe the killer app for this camera system is as an RV rear viewing device. Seeing whats in my large blind area behind the rig is golden! Once I had a camera back there, I don’t know how I did without for so long. 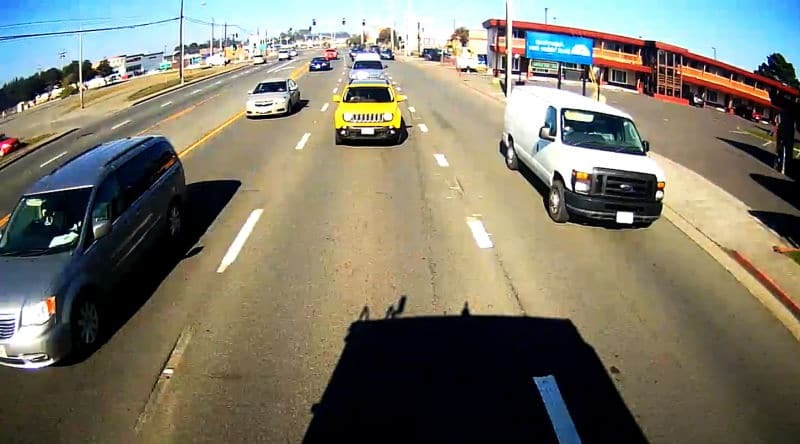 The Haloveiew camera provides a wide-angle view allowing me to see vehicles not only behind me but well off to each side. This is extremely handy when navigated multi-lane freeways and in complex city environments. Recording the action is a bonus. The main specifications of note are a max wireless line of sight range or 984 feet (300 meters), 720P HD resolution, IP69 waterproof rating on the camera, and runs 2.4G wireless frequency. 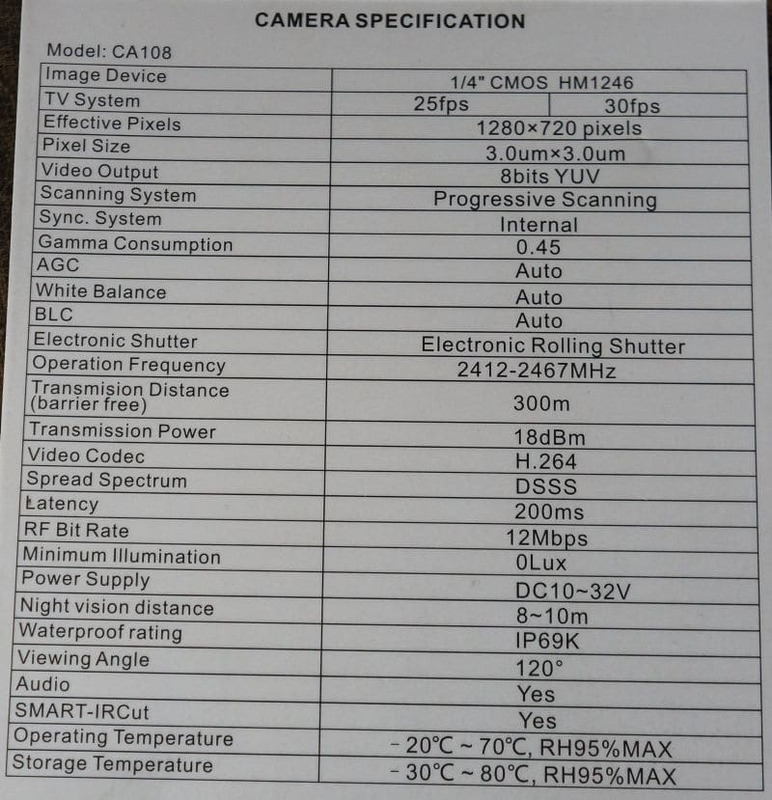 For more nitty-gritty details, I’ve posted photos below of the full camera and display specs found in the manuals. 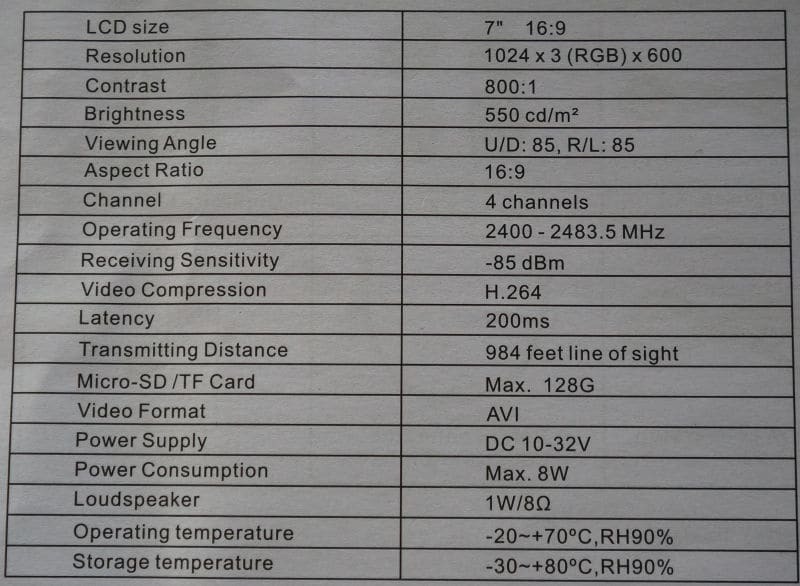 Features and What’s in the MC7108 Kit? The long monitor antenna allows the best reception for long range signal, wireless signal range up to 984 feet. Automatic pairing with monitor happens when the camera is activated. MC7108 720P digital rearview camera system features auto-dimming function, automatically adjust for different brightness levels between day and night. 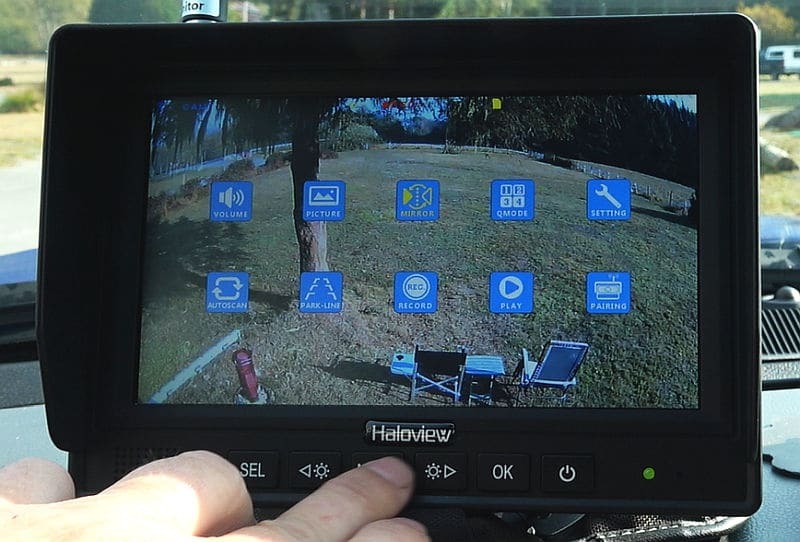 In this video, I test an accessory antenna for extending the range of the Haloview Wireless Backup Camera System.